What is happening is that webi is treating the variable value as a dimension and is not aggregating it across the states for the prior years. So even though the states are not displayed, we still get multiple rows for the years, as if the states were included in the calculation context. Try to change the variable qualification to a measure, and you get the flip side of the problem: now you get the infamous #MULTIVALUE error because webi is treating the list of States like a measure and is unable to aggregate multiple States per Year. Make sure you set the variable qualification to a dimension, and now webi will be able to properly calculate the proper aggregation for each year, as expected. 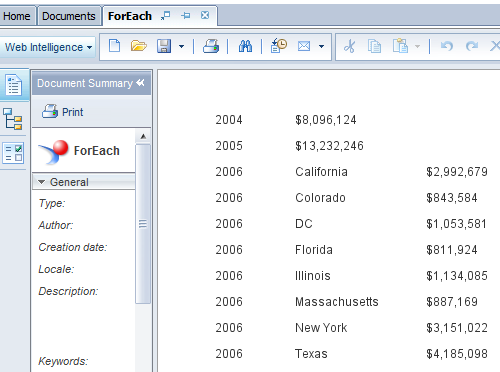 Add a similar formula as your third column variable (If([Year]=”2006″;[Sales revenue] ForEach([State]);””)), apply some formatting (with NumberFormat()), and there you go, requirement met. This entry was posted in Web Intelligence and tagged Web Intelligence ForEach. Bookmark the permalink. I like your article, is comes very close to addressing a #MULTIVALUE issue I am experiencing. I am having trouble getting my context correct in my formula and thought you might be able to help. I have a cross tab with product groups down the left column and date periods across the top (eg TY MTD, LY MTD etc). I have a total column for each Date set eg total column for MTD, YTD, MAT etc. I have a variable that provides +/- variance. The variable is ([TYMTD$s]-[LYMTD$s])/[LYMTD$s]. As I have MTD, YTD, MAT in the one table, I have created an If statement variable that shows the correct calculation variance in the correct total column eg =If [Date Period]=”MTD” Then [MTD $s +/- Total] Else If [Date Period]=”YTD” Then [YTD $s +/- Total] Else If [Date Period]=”QTR” Then [MQT $s +/- Total] Else If [Date Period]=”MAT” Then [MAT $s +/- Total]. This works fine for each of the rows in the table, however my issue is with the total row, where I get #MULTIVALUE. For the total row in other reports I have built I have used an aggregation function like sum, min, max etc which have worked, however, in this case none of these are suitable. I am happy to email you the report to assist with understanding my calculations. Your thoughts on how I could achieve my desired result? Thank you in anticipation of your assistance. Hi Louise, i think you are on the right track with the aggregate function, but there might be some additional complexity in your particular example. Another approach you might be able to use is multiple queries (data providers) for the different date cuts. As long as you can merge the date dim (and any other dim you use in the block), this could simplify your variables a lot. Assuming your query time is short. In your final result above, suppose you wanted another column, BestYear, listing the state’s best year. e.g., suppose Illinois had its best year in 2002 so you’d want “2002” to appear in the new column on the row with “Illinois” in it. works just fine, but the context doesn’t work within the Where clause in the BestYear calculation above – it instead returns #MULTIVALUE errors. Christos, your calc looks fine as “pseudo code”, hard to say where the multivalue error is coming from. In the specific example i published, the first year column might be causing this. My suggestion in these situations is always to start simple and gradually increase the complexity level. So begin by creating a block with states and max revenue. 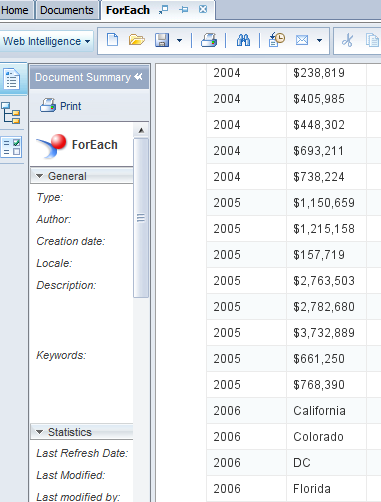 Then, try to add another column where you can compare revenue to the calc from column 2. Also, you might be able to accomplish this with ranking, could be simpler solution. I would like to create a variable that replaces the four rows of DP and put the four values in a comma delimited text resulting in one row of data. Is this possible? Hi Jay, you can use webi formulas to accomplish this, but the solution you can accomplish in webi will probably be limited. I think this will be better solved on the data side. For example, if you are using oracle as your backend, you can use the listagg function to “convert” your rows to a delimited list, either in the universe or further down stream..
Hi Teja, i’m not 100% sure i understand the question, but if what you are looking for is replacing the values Kolk,Noid,gurgaon with the single value NCR, you can simply create a variable in the report and use an if statement to say if cities = Kolk or Noid,gurgaon then NCR. You can look up the webi syntax in the help files. If you would like to do this for more then one report, it would be better to create a universe object with a case statement to accomplish this. Thanks. But I’m getting #MULTIVALUE error. I tried the ForEach approach but still the error comes. This should work Sumit. I assume you need to create a block with two columns, customer and sales. Make sure to convert the formula to a variable of type dimension for the customer, and sum() the [sales} measure in the next column. Hi I have a similar situation. But FOREACH does not seem to solve my issue. The data is displayed as above. But I want it to be displayed as below. I am running into a kind of similar issue. I have a report with 2 similar queries for different businesses with 3 tabs for Business A, Business B and Business A+B. Each of the tabs need to display Top N dimensions (along with the rank), their attributes and the measure value. One of the attributes is derived from another table. It changes over time and we only need the latest attribute but the total value for the measure (I can achieve this with a calculation context). The rank still works. But I have 2 lines for each of the attributes even with a calculation context for the measure. Your suggestion is most welcome and appreciated. Oops! The values are not aligned under the right header. Please match the numbers to the measure, ABC/DEF to Attribute 3 and X/Y/Z to Dimension. Let me know if you have any questions. Gayathri, i think your issue is related to the ranking, so you need to rank on the right combination of dims. Also, look for info on dense rank in webi, there are many posts about this topic with nice work around related to generating random numbers to make the ranking dense. I have similar kind of issue. Is there any function which can convert the result from one single row into columns? I would like to choose the first of surgeon cases in each of the 23 operating rooms and if a surgeon is schedule to operate in the first case in multiple rooms, I only want his earliest case. I am using the Min function =if(Min[scheduled startdate and time] In ([Actual OR Number])=(Scheduled Start Date and Time] And (First Scheduled for each surgeon]=Scheduled Start Date and Time]);1). I also have a variable =Min([scheduled Start Date and Time]) in ([scheduled Primary surgeon]). My results on the report show the same surgeon in Multiple OR rooms, I only want the surgeons earliest case. Any suggestions will be appreciated. Result = 3 because there are still the same, not repeated materials, and the count is still at material level. Can I use the ForEach() in here or what do you suggest ? I have already used the count() and aggregate() functions but not working. I already did it on the BEx Query Designer with exception Aggregation (count) and Material as reference Characteristic, but the total is displayed as #notavailable even if I refresh the webi. So I want to replicate it on webi creating a variable on it. Have you tried summing the counts? I’m new to SAP BO and I’m having a hard time getting the correct results in a summary report (and I don’t have access to the Universe, for changes into that I need to request them to somebody else). I need to get the date of a maximum amount,and only get one row per person (there may be more than one expense per date). When I test it, I get rid of the ExpenseAmount and I add a column with the variable name and it seems to compare the sum of all the amounts of all the report against the maximum value and I get nothing. But it didn’t work either. When I include the ExpenseDate field, the table shows as if it’s getting the right “date of maximum amount” and the other rows are left with blank, but once I get rid of the ExpenseDate column in order to be left with only one row, I get the MultiValue. And I can’t just add a filter to the report table because the this is part of a bigger report, so several other columns are involved (although this is the only one giving me a hard time). How can I get this date of the maximum amount into only one row for this case? Need your advice on one query! I Need to reflect “Lease Number” in one liner, as of now due to all the different clause type “Lease number” repetitive in report. Client is looking for lease number should be come in one row with different clause type. Note : Same logic used in all the diffrent caluse type. I am using BO XI 3.1. I have a feeling For Each is my answer, but I’m having trouble figuring out the right way to use it. Please help!! I have data similar to below and I want to be able to compare the Start/Finish Dates of each step 1, 2 to the benchmark step 0 for each Project A, B, etc. I’m trying to confirm the dates for Steps 1 & 2 are not before Step 0. If I put this variable I’m attempting to create back in the table on the webi, I would expect to see the following data. Reposted with better formatting for data! I need all to add up for each day.. so the total for 09/27/15 would be 122, and then have this continue for each day thereafter. Any help or suggestions would be greatly appreciated. Thank you. Hi Paul, that should be fine to do using calculation context. So you can specify =sum([count measure]) in ([day dim name]). This should give you the total across all departments per day. Here from table we can see the CY value and PY value of Sales ,Discount,Margin is different,what is the logic behind it.Data coming from Same Universe. from here i thought of merging the tables and convert into Cross Tab Table. anybody providing solution highly appreciated. If the solution meets the requirement ,the other question is related to dynamic input controls where it hold measure objects i.e. Sales,Discount and margin.If we click that object it should work on cross tab. Can some body help me out on how to apply filter only on Grand Total > 1000 when their is huge list of Monthly sales in cross tab as per the below example list. This formula is exactly what I needed to filter some subtotals on a crosstab, thank you very much! Hello, hopefully someone can help me with this problem. It is quite similar to other questions but just a little different. I am trying to average a column based on the day of the week. but it just returns the #MultiValue error. There are posts close to this but not quite. I want to return the [Service] that is associated with the latest [Service Date] by each [Org Name]. But TopService just gives #MULTIVALUE for A and B. C is OK since it only has one value. This should produce a table with the org, service and max service date for each org/service combo. Thank you, biha8964, but I’m looking for the value associated with the max date and not just the max date itself. I figured it out. Here is one way. i have the data but how to display it? I want to display data in Cross tab in SAP Business Objects report. I am geting Mutivalue error beacause for one date,there are multiple rows. 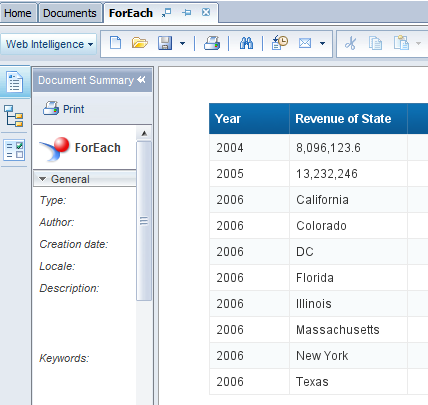 I have been working on a specific report for months and always am exporting to Excel to do vlookups. My scenario: A patient who is receiving Home Health in the community comes into the Emergency Department multiple times throughout the year. I want to see how many ED visits this patient has while the Home Health referral is open. The problem I am having is that a patient may visit the ED multiple times AND have multiple Home Health referrals open. I would usually bring my two queries (separate universes for ED and Home Health), and do a vlookup to get my sums. I have tried to do this in Webi, but was having the issue of #MULTIVALUE. I believe I have found a workaround for this, but am still struggling with the issue of each ED visit only looking at one referral, not all of them. Referral Start | Referral End | ED Visit | ED during? 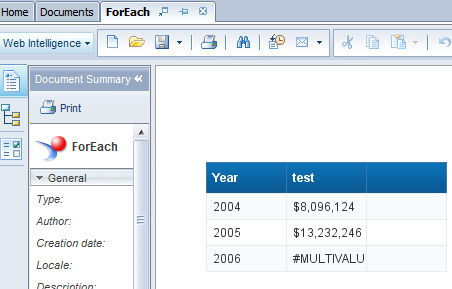 I have also tried the ForEach formula but then run into the #MULTIVALUE error. You need to include all the relevant dimensions in the “in” argument. I assume there is some sort of “referral id” you can use to tell one referral from another..? Finally, you should be able to create a calc that counts/sums dates between each of those, along these lines: Count([Ed Visit];distinct) where [Ed Visit] between [RefMin] and [RefMax]… You may still need to add calculation context dims in the final formula.. Of course you will need to weak this per your universe, etc, but hope this helps with the thinking.. But I only want one entry for “Others”. How do I show all “Others” as one cell value only for Actual Failure %? If you need the [POF Location Code] dimension in the calculation context, and there are different [POF Location Code] values for “Others”, i do not see how you can avoid that.. Will need more data prep work in the DB/Universe. Otherwise, you can use an aggregate function to aggregate the results across the dimension that yields either “Others” or value, and that should be fine.. I get stuck in this report, so please help me if you can. I do the break on OrderID, then rank on OrderDate, somehow, I still not get it right. the ReceiveDate missing for the Order which have multiple OrderDate.